Hey everyone! Hope you are all well. Today I thought I'd do a little bit of a different post for you all. Now I know a lot of people look down on these kinds of posts. I know I do sometimes, because a lot of the time you think people are telling you how to blog and what to do. I want to write this in the best way I can possible can and without sounding like I'm telling you what to do so I really hope it comes across that way. 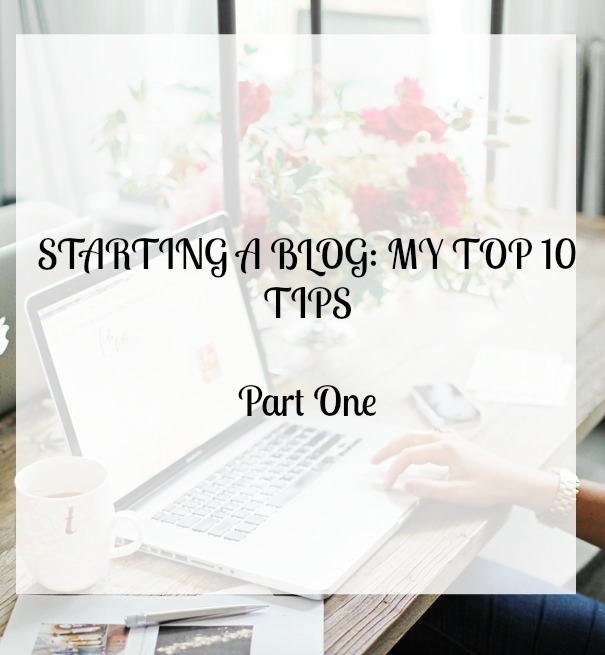 I wanted to do a top 10 tips for those of you who want to start a blog. I've spoken to quite a few people recently who have wanted to start a blog and a few people where I'm currently doing work experience have mentioned that they would be interested in it too. This is aimed at everyone out there who wants to start a blog whatever it may be, not just for beauty and fashion. I really hope you find this post helpful and useful and I really hope I don't come across as telling people what to do. It's just something I've wanted to write for a while. Before I started my blog I would have loved something like this to read. Look at my first ever posts to know why. ENJOY! The most popular blogging platforms out there are blogger (which is what I use), wordpress and tumblr. All of these websites are absolutely incredible for starting blogs however I'd personally recommend blogger as I think it is so incredibly easy to use and you can design everything yourself from your header, to the social media buttons to how you want your blog to look. There are a lot of bloggers out there who also do blog designs if you'd like to invest. I got my blog design custom made from the beautiful and talented Pursuit Of Felicity who has also designed Niomi Smart's blog design and Kayleigh's from CoutureGirl too. She's really talented and I'd highly recommend her if you want a simple yet stylish blog design for blogger. However if you want to go a bit more advance then word press might be the best for you but I really don't know too much about it other than the fact it has a more professional look and feel to it. If you don't want to pay for a theme and want a simple blog where you can easily upload photos and write posts then tumblr will be for you. There are a lot of lovely people out there who do beautiful blog designs for tumblr that are absolutely free for you to use as long as you don't remove any of the accreditation. There's a tumblr link on my blog if you'd like to see what mine looks like. This is sort of tied in with platform and what I said about blog designs. Now obviously it is your blog so the layout is entirely up to you! However, in my experience and I do agree with a lot of other bloggers who said this, having a layout that's easy to navigate is quite important. Make sure that there is easy access to where people can find out more about you, follow your blog and of course the main part, read your blog posts. A lot of blogs now are starting to have those designs where they have there blog posts listed with a read more option which I love or like me you could just have your blog posts there so when people click on your blog they are able to read it straight away. Now when I first started this blog I didn't have a clue what I wanted it to be. I just remember reading Zoe's, Tanya's, Kayleigh's and then I remember thinking, I could do that so I just decided to start a blog. I honestly didn't have a clue what I wanted it to be and what content I wanted to include on it. In fact, some of my earlier posts were film reviews and book reviews. All gone now of course because I wanted my blog to be more on the fashion/beauty/lifestyle side of things and I really wanted to join in with that community on social media. However I think it's important to remember not to worry if you don't have a particular subject or content in mind. Write about whatever you want to write about and maybe along the way, like me, you'll decide in what direction you want to go in or maybe you just want to include everything you're passionate about on one blog. Mine is starting to turn into that and I love it! Don't feel pressurized to write about what everyone else is writing about. It can be a bit daunting when you write about something and then realize oh, I stick out like a sore thumb here, but trust me it's good to be different and the reason blogging is becoming increasingly popular is because everyone out there have their own opinions and own views on things and that's what makes it really interesting. On the other hand don't think oh everyone else is writing about that, maybe I shouldn't. Do it anyway! I could read a million reviews on one mascara or certain product but they will all be different in terms of opinions and views and I think that's what makes blogging very special. We are all just normally people with opinions. Why not share them for others to see too? If you ever feel like you shouldn't write about a topic, write about it anyway! The more opinions out there the better. When it comes to blogs you will all obviously need some sort of computer to type of blog posts. Depending on what sort of blog yours is any photographic device will come in handy. Most of us out there now have phones which will take amazing pictures. I really don't like when people do these posts and say you should invest in a camera. Not everybody is made out of money and I've taken plenty of blog photos using my iPhone and I've often been told how good the quality is. As long as you are happy with the photos that's all that matters. Don't worry about having a big flashy expensive camera. If you want to edit your photos don't worry about not being able to afford the popular photo-shop either. There are plenty of online websites where you can edit your photos to get them to exactly how you want too and many of them free. One of my favorite sites to use is Pic-monkey which is amazing. If you want to add text to the photo (like I did above) then this is an amazing tool for that. I use this website all the time to brighten my photos and add text. It's incredible. AND IT'S FREE! When it comes to getting your blog out there and introducing what you have to say social media is absolutely amazing for this. I mainly use twitter to promote my blog as I find this is the best tool for finding other bloggers and people who share the same interests as you. I think that if you want to start a blog twitter will be the best way to get your blog out there and to communicate with other people. Depending on what type of blog yours is you can also take part in weekly blog chats where there's different topics every week and you'll find yourself speaking to so many different people. The amount of people I've met through blogging has amazed me and I'm lucky enough to be able to call some of them my friends. I also think it's very important to comment on other blogs as well. I'm not going to lie here, this is something I'm really bad at. I made a conscious decision at the beginning of the year that I would comment more and I did really well in January but this month I have definitely been slacking a little bit. When you comment on a blog post it's always good to leave your link underneath as well so that people know where to find you too. It works both ways. Finally I'd recommend signing up to bloglovin' which is a website where you can follow other bloggers and discover different types of blogs too from food to fashion to fitness. Everything is there and you can see who the most popular bloggers are too. You can also place a widget on your own blog so that you can see how many readers you are gaining too. It's an amazing website. I'll end this post here as like I said I'll be splitting this post up in two parts but I hope you enjoyed Part One and it has helped any of you who are starting a blog out there and I hope this helped maybe those of you who already have a blog and are in the beginning stages. This was definitely longer than I intended it to be but like I said above I really hope this post didn't come across as telling you what to do and being preachy but I just wanted to share my experiences with you all. Let me know what you think below and if there's anything you'd like me to discuss in part two let me know in the comments below. Have you got a blog? Make sure to leave the links below so I can check them all out! These blogging tips are great & spot on. Cameras are not the be all & end all, it's about your skill and knowledge of how to take a decent photo mainly. Glad I came across your blog. It's awesome! I'm new to blogging and some of your tips have really helped! Thank you!